Bauchi (earlier Yakoba) is a city in northeast Nigeria, the capital of Bauchi State, of the Bauchi Local Government Area within that State, and of the traditional Bauchi Emirate. 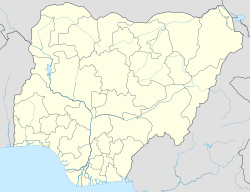 It is located on the northern edge of the Jos Plateau, at an elevation of 616 m. The Local Government Area covers an area of 3,687 km2 and had a population of 493,810 at the time of the 2006 Census. The city was founded by Yaqub ibn Dadi, the only non-Fulani flag-bearer of the Sokoto Empire. The name was derived from a hunter called Baushe, who advised Yaqub to build his city west of the Warinje mountain. In return Yaqub promised to name his city after the hunter. Abubakar Tafawa Balewa is buried in the city, while the Yankari National Park is 110 km from the state capital. The city lies on the Port Harcourt – Maiduguri railway line. The Bauchi State Library Board was established in 1976. In July 2009, attacks in Bauchi by Boko Haram following the arrest of some of its members resulted in over 50 people killed and over 100 arrested. After the 2014 Chibok kidnapping, over 200 students were transferred to the Federal Government Girls College, Bauchi. The majority were from Federal Government Girls’ College, Potiskum, Yobe State. Bauchi was originally served by a narrow gauge 762 mm (2 ft 6 in) light railway, but this was later converted to the normal gauge of 1,067 mm (3 ft 6 in). Up until August, 2014, Bauchi was served by Bauchi Airport, located in-town. Scheduled airline service was then transferred to the newly constructed Sir Abubakar Tafawa Balewa International Airport, 23 kilometres (14 mi) north of Bauchi, near the village of Durum. According to the Köppen Climate Classification system, Bauchi has a tropical savanna climate, abbreviated "Aw" on climate maps. ^ "Reporter: More than 200 dead in Nigeria violence". Kyiv Post / AP. 2010-03-07. Retrieved 2014-05-11. ^ "Yobe Killings: Bauchi Receives 200 Students, Articles". This Day Live. 2014-03-20. Archived from the original on 2014-05-12. Retrieved 2014-05-11. ^ Nigeria Under British Rule - Sir William Nevill Montgomerie Geary - Google Books. Books.google.com.au. Retrieved 2013-12-10. ^ "Bauchi, Nigeria Köppen Climate Classification". Weatherbase. Retrieved 2013-12-10. ^ "Klimatafel von Bauchi / Nigeria" (PDF). Baseline climate means (1961-1990) from stations all over the world (in German). Deutscher Wetterdienst. Retrieved 25 February 2016. This page was last edited on 10 January 2018, at 13:43 (UTC).